With growth slowing, a lack of infrastructure investment catching up with it, and rising competition in the neighborhood, the Capital of the New South is looking vulnerable. Atlanta is arguably the greatest American urban growth story of the 20th century. In 1950, it was a sleepy state capital in a region of about a million people, not much different from Indianapolis or Columbus, Ohio. Today, it's a teeming region of 5.5 million, the 9th largest in America, home to the world's busiest airport, a major subway system, and numerous corporations. Critically, it also has established itself as the country's premier African American hub at a time of black empowerment. Though famous for its sprawl, Atlanta has also quietly become one of America's top urban success stories. The city of Atlanta has added nearly 120,000 new residents since 2000, a population increase of 28% representing fully 10% of the region's growth during that period. None of America's traditional premier urban centers can make that claim. As a Chicago city-dweller who did multiple consulting stints in Atlanta, I can tell you the city is much better than its reputation in urbanists circles suggests, and it is a place I could happily live. Yet the Great Recession has exposed some troubling cracks in the foundations of Atlanta's success. Though perhaps it is too early to declare “game over” for Atlanta, converging trends point to a possible plateauing of Atlanta remarkable rise, and the end of its great growth phase. As with many other boomtowns, in Atlanta growth itself has been among the biggest industries. Construction particularly played a big role in its economy. The housing crisis cut the legs from under Atlanta's real estate machine. Though prices didn't collapse, new home building did. From 2005 to 2009 Atlanta's number of annual building permits fell by 66,352, the biggest decline of any metro area. Atlanta grew strongly in the 2000s, with growth of over 1.2 million people, a 29% rise that beat peer cities like Dallas and Houston. But look at the recent past and see a very different dynamic. Domestic in-migration has cratered, only reaching 17,479 last year, or 0.32%. While migration did slow nationally last year due to the economy, Dallas and Houston continued to power ahead. Dallas added 45,241 people (0.72%) and Houston added 49,662 (0.87%). Even Indianapolis added 7,034, but that's 0.42% on a smaller base, meaning Atlanta is actually getting beat on net migration by a Midwest city; its in-migration rate is about on par with Columbus, Ohio, another healthy Midwest metropolis.. The collapse in in-migration should be very worrying to Atlanta’s leadership. No new people, no new housing demand, thus no construction jobs. It should come as no surprise that Atlanta's 10.8% unemployment rate is well ahead of the 9.7% national rate. Last July, Judge Paul Magnuson ruled that Atlanta had been illegally taking water from Lake Lanier, the principal source of the region's water supply. The ruling may not stick but it nevertheless has brought into focus the long term insufficiency of the water supply for Atlanta. Lake Lanier almost ran dry during a recent drought, but has since recovered in the recent wet years. The problem is more political than environmental. Atlanta has not appreciably expanded its water sources in 50 years despite all that growth. But the biggest infrastructure issue for Atlanta is transportation. Atlanta is famous for its bad traffic and attendant pollution. Its freeways are among the world's widest, but this disguises the extent to which the roadway infrastructure is woefully insufficient. 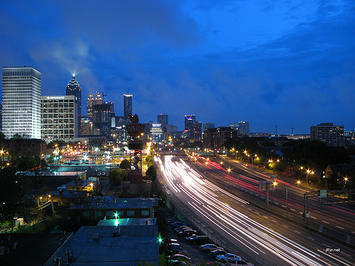 Atlanta has a simple beltway and spoke system similar akin to Indianapolis and Columbus, much smaller cities. Other big cities like Houston, Dallas, Minneapolis, and Detroit have much more elaborate systems. In particular, rather than relying on a single ring road, these cities have webs of freeway with multiple “crosstown” routes. But Atlanta's greatest road problem lies in the lack of arterial street capacity. Atlanta's suburban arterial network is mostly former winding country roads, many of which have never been upgraded to handle the traffic demands on them. Most upgraded streets are radial routes, not crosstown ones, which forces even more traffic onto the overloaded freeway network. For those who prefer transit, Atlanta hasn't invested there either. It built the MARTA heavy rail system as an extremely forward looking transportation investment, mostly in the 1970s and early 80s. This was built before Portland's system and is far better than light rail to boot. But there has been almost no expansion of the network. The state of public transport has been largely frozen for some time. Meanwhile, Dallas, Houston, Phoenix, and others have invested billions. Bad traffic congestion and other infrastructure ills didn't matter much when Atlanta was the only game in town. For a long time, anyone who needed a presence in the Southeast found Atlanta the easy default answer. In many cases it was the only real possibility. That's no longer true. Atlanta is now surrounded by upstart, much faster growing cities such as Charlotte and Raleigh-Durham in North Carolina, Nashville, Tennessee and Charleston, South Carolina – all in many ways now have the ambitions once characteristic of Atlanta. Atlanta's problem lies in its insufficient differentiation from these other places. Other than the airport, a clear major asset to Atlanta, what do you actually lose by moving to Charlotte or Nashville? Your commute is likely to be less. Except for certain groups – African Americans or gays – the city seems to be losing allure. These other cities also have the talent to compete for a lot of the business Atlanta used to pick up without working for it. The new head of the Atlanta Regional Commission declared Atlanta's love affair with the edge city high rises all but over. Planners always talk like this, but it is still a startling sentiment to hear in Atlanta, formerly the most boosterish of cities. That's the sound of a city losing its mojo. Meanwhile, Charlotte chamber of commerce chief Bob Morgan says, “To understand Charlotte, you have to understand our ambition. We have a serious chip on our shoulder. We don’t want to be No. 2 to anybody.” That's the way Atlanta used to talk. Atlanta does seem to realize it's in a different competitive world. It must elevate its game and upgrade its product. Like Chicago and other growth stories before it, as Atlanta got big and rich, it decided it needed to get classier as well. To go for quality, not just quantity. And to embrace a more urban future for its core. But it might be too little, too late. Atlanta is urbanizing, but despite the huge influx of people into the city, it's not there yet. Atlantic Station got built and attracted lots of press, but numerous other mixed use projects were killed by the poor economy. Ambitious projects like the Beltline park and transit project lack funding. Atlanta is left as a sort of “quarter way house” caught between its traditional sprawling self and a more upscale urban metropolis. It offers neither the low traffic quality of life of its upstart competition, nor the sophisticated urban living of a Chicago or Boston. Here too, Dallas and Houston continue to power ahead of Atlanta. Both are seeing significant urban infill and are also making major investments in cultural infrastructure that far outstrip those of Atlanta. For example, Dallas just opened a showplace performing arts complex, with buildings by the likes of Norman Foster and Rem Koolhaas. Houston has emerged as a dynamic multi-cultural city. Both have a long way to go, but are in a much stronger growth position to pull it off. Cities, like companies, go through a life cycle. There's the youthful founding, the explosive growth phase, then maturity and, for some, decline. Chicago and Detroit were two of the huge growth stories of the industrial era, for example. Atlanta, Houston, and Dallas have been three of the boomtowns of the current age. Like other cities before them, that growth will come to an end one day. It is then that we'll see if, like Chicago and New York, they will succeed as mature regions and truly take their place in the pantheon of great American cities, or, like Detroit or to a lesser extent Philadelphia, will decline or stagnate. Atlanta is far from dead, but it may be facing the beginning of the end of its growth cycle. If so, this will be the true test and measure of the greatness of that city. Will Atlanta make the grade? And how?